Whole Foods for the Whole Family: notice the spiral binding. Classic. Back in the day, my parents cooked from a certain cookbook quite a lot. 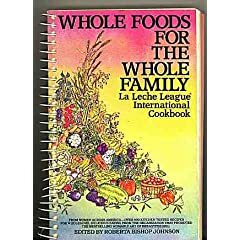 That book, Whole Foods for the Whole Family, was published by LaLeche League International, which, just as it sounds is a still-active breastfeeding advocacy group. At any rate, many of these recipes have become old standards in our family, and this christmas, my parents got all three of us (that is, myself and my two brothers) copies of the original. 1 lb. ground beef or cubed tofu*. *A note on the tofu: cubed tofu is fine, but if you’re looking to keep the ground beef texture, place a block of tofu in the freezer, allowing it enough time to freeze solid. Then thaw it out, and crumble it. It will mimic the look and feel of ground beef quite well. 1). Saute onion and garlic butter. 2). Add beef (or tofu) and brown. 3). Add seasonings and vegetables.